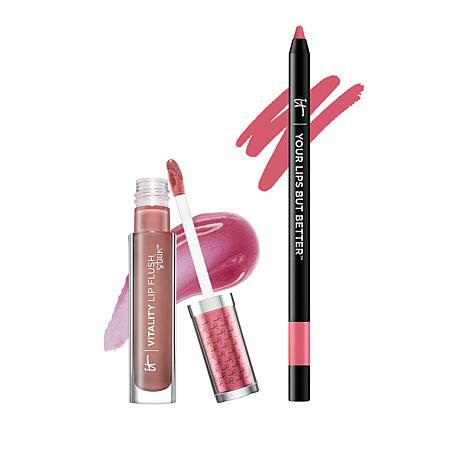 A lip stain and lip liner duo designed to help you achieve gorgeous looking lips that last! Minimize the appearance of lip lines and keeping your lip color in place! 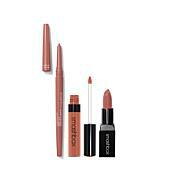 Delivers high shine and rich pigment that glides on like a lightweight serum, instantly hydrating lips! Begin with clean, bare lips. Twist up your automatic pencil and begin tracing your natural lip line using light stokes, beginning at the center of your lip line and working outward. For fuller-looking lips, hug the very outer edges of the lip line as you apply. Ingredients: Polybutene, Helianthus Annuus (Sunflower) Seed Oil, Octyldodecanol, Euphorbia Cerifera (Candelilla) Wax, Copernicia Cerifera (Carnauba) Wax, Ricinus Communis (Castor) Seed Oil, Trihydroxystearin, Ethylhexyl Palmitate, Calcium Aluminum Borosilicate, Synthetic Fluorphlogopite, Polyethylene, Carthamus Tinctorius (Safflower) Seed Oil, Tribehenin, Silica, Bumetrizole, Tocopheryl Acetate, Retinyl Palmitate, Ascorbyl Palmitate, Vanillin, Simmondsia Chinensis (Jojoba) Seed Oil, Butyrospermum Parkii (Shea Butter), Sorbitan Isostearate, Punica Granatum (Pomegranate) Extract, Camellia Sinensis (White Tea) Leaf Extract, Vitis Vinifera (Grape) Seed Extract, Persea Gratissima (Avocado) Oil, Aloe Barbadensis (Aloe Vera) Leaf Extract, Chamomilla Recutita (Matricaria) Flower Extract, Argania Spinosa Kernel Oil, Camellia Oleifera (Green Tea) Leaf Extract, Olea Europaea (Olive) Leaf Extract, Silica Dimethyl Silylate, Prunus Domestica Seed Oil, Prunus Cerasus (Bitter Cherry) Seed Oil, Butylene Glycol, Hyaluronic Acid, Cholesteryl Oleyl Carbonate, Cholesteryl Nonanoate, Cholesteryl Chloride, Palmitoyl Oligopeptide, Hydrolyzed Collagen, Phenoxyethanol. May Contain: Mica (CI 77019), Titanium Dioxide (CI 77891), Iron Oxides (CI 77492, CI 77491, CI 77499), Yellow 5 Lake (CI 19140:1), Blue 1 Lake (CI 42090:2), Red 7 Lake (CI 15850:1), RED 27 (CI 45410:1), Red 30 Lake (CI 73360), Red 6 (CI 15850), Carmine (CI 75470), Red 28 Lake (CI 45410). Ingredients: Cyclopentasiloxane, Trimethylsiloxysilicate, Polyethylene, Ceresin, Isododecane, Synthetic Wax, Candelilla Cera/Euphorbia Cerifera (Candelilla) Wax/Cire De Candelilla, Polyisobutene, Dimethicone, Methicone, Argania Spinosa Kernel Oil, Butyrospermum Parkii Butter, Palmitoyl Hexapeptide-12, Persea Gratissima (Avocado) Oil, Prunus Avium (Sweet Cherry) Seed Oil, Prunus Domestica Seed Oil , Simmondsia Chinensis (Jojoba) Seed Oil, Tocopheryl Acetate, Vitis Vinifera (Grape) Seed Oil, Cholesterol, Tocopherol, Collagen, Hyaluronic Acid, Hydrolyzed Silk, Retinyl Palmitate, Aloe Barbadensis Leaf Extract, Olea Europaea (Olive) Leaf Extract, Punica Granatum Extract, Camellia Sinensis Leaf Extract, Chamomilla Recutita Flower Extract, Mica (CI 77019), Titanium Dioxide (CI 77891), Iron Oxide (CI 77492, CI 77491, CI 77499), Red 7 Lake (CI 15850). This is a great duo, lip liner gives great coverage and they match perfect together. Love this perfect shade of mauve, and stays on after eating! I am an It girl but never tried their lip products. I have now tried two and love them both. This product with the liner and gloss is fabulous. The color is just what I wanted. The gloss is not sticky and is great!